The Auschwitz Zentralbauleitung (Central Construction Headquarters) letter dated 28 June 1943 indicates a Leistung (output/capacity/performance) of the crematoria of Auschwitz-Birkenau which is technically impossible in terms of both cremation duration as well as coke consumption. While this is not the place to delve into arguments which have been previously presented2 it must be stressed that such alleged Leistung is about 4 times more than the true one, while fuelcoke consumption amounts to almost 3 times less than necessary. 1.0 The J.C. Pressac interpretations. 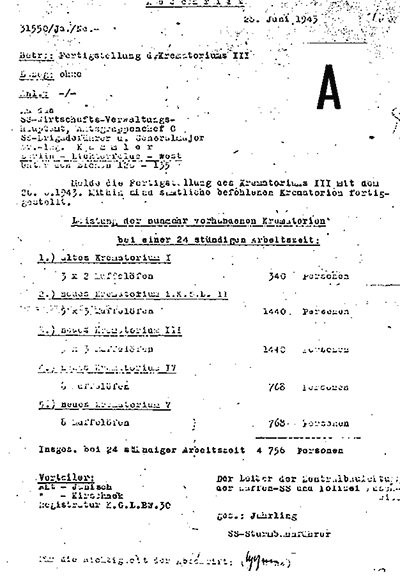 "On 28th June , following the handover of the Krematorium III, the last one to be completed, Jährling calculated the overall throughput for the five Krematorium as 4,756 persons in 24 hours, and sent this information to SS General Kammler in explaining operations to high-ranking visitors (cf. SS Major Franke-Gricksch's report above, giving a figure of 10,000 in 24 hours), had no basis in practice, and probably has to be divided by two or three to arrive at the true figure. The different visitor, SS, political leaders or others, were obviously unable to check the figures given by the cam SS, but accepted them as true and went away praising the Auschwitz SS for having found such splendid solution to the "Jewish question". 60 per hour x 24 hours = 1,440 corpses per day. (As a result of the sizeable occupants (125,000 prisoners), a Crematorium is being constructed. It contains 5 [crematory] muffel ovens each [oven] with 3 muffles for 2 men, so that in one hour 60 men could be cremated). which would amount to cremating 2 adult corpses per muffle per half hour! This exchange of correspondence cannot be purely coincidental and there is no doubt that on this point Pressac was correct; but this relates to purely formal correspondence, because the Leistung referred to in this document - [cremating] 2 corpses in one muffle in 30 minutes - had to do with a different project, though illusory, by Kurt Prüfer. In the month of October of 1941, the Topf 3 muffled-oven was still a project in its building phase, in which the only stable principle was the assembling of three interconnected muffles. The reference appearing in the Erläuterungsbericht of 30 October 1941 corresponded to a different project from the one already completed, as different as the one relating to the "Kostenanschlag auf Lieferung von 2 Stück Dreimuffel-Einäscherungs-Öfen" (cost estimate re delivery of 2 three-muffled crematory ovens) of 12 February 1942,7 where the 3-muffled oven had been fitted with only one gazogene located with the central muffle. This argumentation is nothing but a simple excuse to avoid the problem. The introduction of women and children corpses into the Leistung is not only not born out by the subject letter, but is in open contradiction to what Pressac precisely wrote in 1989: since the Leistung of the four crematoria of Birkenau could not come from the Erläuterungsbericht mentioned above, and since that document indicates a Leistung of 2 adult male corpses per muffle per half hour, what is the idea of then introducing corpses of women and children into the calculation? That crematorium was destined for Soviet prisoners of war and it does not make sense to me that the Soviets would send women and children to the Front. Other than historically, the explanation offered by Pressac is unfounded also technically, because the Leistung of the crematoria at Birkenau corresponds to the cremation of 4 corpses per hour; even if we accept the Pressac data (one man 70 kgs, one woman of 50 kgs and two children of 10 kgs each), the above-mentioned Leistung would be impossible, while the cremation of such a load in one muffle, equivalent to two corpses of 70 kgs, would have required double time (120 minutes),11 but this, for the crematoria of Birkenau, corresponds exactly to the capacity of the Leistung indicated in the letter. The problem thus remains unsolved. (Key Document is a Forgery) (VffG, Heft 3, September 1998, pp. 166-174). Ingenieur M. Gerner, in the article referred to above, has tried to solve the problem by adducing an interpretation which in my judgment cannot be separated from the general formulation because it starts with the assumption that the 28 June 1943 letter is a "Fälschung" (fake), though eventually, as shall be explained shortly, it cannot be anything else but a Verfälschung" (a fraudently altering) of an original document. From the viewpoint of methodology, the presentation in photocopy of documents A-E (pp. 166-168) may have its own justification in History, but not in Criticism, because the only version of the document worth criticizing is the photocopy of the original, i.e. version B-D. I refer to "version" (singular) because documents B and D are two photocopies of the very same document. Version A is not actually a "Fälschung" as the author believes (p. 168), but a very normal archive "Abschrift" (copy) of a photocopy of the original document made by Archivist Cossens, who certified at the bottom of the copy, the conformity of the transcription with the original ("Für die Richtigkeit der Abschrift") (for the correctness of the copy). The Archivist has believed that the handwritten name appearing on the left [side] under "Verteiler" (distributor) - Jährling - was that of the author of the letter, thus wrote it down on the right [side] attributing him at the same time the title of SS-Sturmbannführer, a title that correctly belonged to Bischoff. Version C is a simple transcription of the document shown in a book and is not herein referenced. Version E is identical to version B-D, but without the page heading. From the viewpoint of methodological accuracy, we must therefore take into consideration only version B-D. It is a mistake that up until now no original of the document has been noted (p. 168) : the original document is precisely the one kept in Moscow with the following reference: "502-1-314, p. 14a". No "delo" (file/dossier) "502-1-314a" exists in the Zentralbauleitung archives (the author of this text has examined them all). The subject document is not a late one as one seems to believe (p. 166). In Moscow, I have seen a translation in Russian by the Soviet Commission for Investigations at Auschwitz of February 1945, but I am not in a position to indicate its exact archival reference. The number of the Brieftagebuch (reference ID) of the letter - 31550 - appears also in the "Aufstellung der bereits übergabenen Bauwerke an die Standortverwaltung" (a list of the already handed over structures to the local administration)14 at the beginning of 1943, hence there cannot be any doubt about its exactness in requirement of "Fertigstellung des Krematoriums III" (completion of Crematory III) . The abbreviation "Ja" designates the SS-Untersturmführer (F) Janisch, who was Bauleiter of the Bauleitung des Kriegsgefangenenlagers (construction head of the building administration of the prisoner of war camp) and in that title, his initials show in the Brieftagebuchzeile (reference identification) of the letter under consideration. The abbreviation "Ne" designates, on the other hand, the SS-Sturmann Nestripke, who at that time was surely part of the said Bauleitung. The "Verteiler" (distributor) indicated the outside addressees 15 of the copies of a document. In the first line ("Akt-Janisch"), the name "Janisch" is canceled and the hand-written abbreviation "Bauw" is added. This is perfectly understandable: given that the job of Janisch was to write the letter, he could not be at the same time the addressee of the same. For that reason, "Janisch" was canceled. This is therefore an error of the writer. The abbreviation "Bauw." is surely the abbreviation of "Bauwirtschaft" (building industry) as it appears in the "Verteiler" of other documents, for instance the Zentralbauleitung letter of 16 May 1944 16 which is self-explanatory, as the letter has the Fertigstellung of a Bauwerk (Crematorium III) as its subject. The second line shows Kirschnek who was Bauleiter of the Bauleitung der Waffen SS und Polizei Auschwitz and to whom the copy was addressed for information in his capacity. The third line of the "Verteiler" indicates the "Registratur K.G.L. BW 30" where normally all actions relating to all the crematoria of Birkenau were registered. Finally there follows the handwritten name "Jährling". This is not a signature, as the author of the article believes (p. 172) because Jährling signed differently and by rule added the abbreviation "ZA Ing." (Zivilangestellter Ingenieur) to his signature. Jährling, by profession a Heating Systems Technician, was part of the "Technische Abteilung" (technical department) of the Zentralbauleitung which took care, among other things, of all the "Heizungsanlagen" (heating installations) of the camp, including the crematoria; hence it is not surprising that a letter copy would be addressed to him also for information. The "inhaltliche Fehler" (content errors) mentioned by the author of the article (p. 171) are irrelevant or simply misspellings, therefore how can it be considered a "Falschmeldung" (false report) that Crematorium I had ceased operation on 19 July 1943 as the letter in question is from before that date, being dated 28 June 1943? The fact that on 28 June 1943, Crematorium II was temporarily out of service has no importance at all regarding the finality of the letter, which refers bureaucratically to the plans, as completed Bauwerke (construction projects), independently of their operating at that particular moment. On this question, which is more important than may at first appear, I shall return. Summing up, the Brieftagebuchzeile, and more so the "Verteiler" lead us to think more about a "Verfälschung" (fraudently altered) than a "Fälschung" (fake) document. However, even this hypothesis has its weak points. Anyway, who could have been the forger? That document certainly existed already in February 1945, but it is difficult to attribute it to the Soviet Commission of Investigation, because this is too contrasting with the data brought out by the Soviet specialists who investigated a Leistung of 300 to 350 corpses per day for Crematorium I; of 3,000 per day for each one of Crematoria II and III, and of 1,500 for each of Crematoria IV and V. If the forger had been a member of that Commission, it seems reasonable to think that he would have introduced this data in his forgery. The forger may also have been a prisoner employed in the offices of the Zentralbauleitung, who could have been able to carry out the forgery between the time of the escape of the SS and the arrival of the Soviets; this forger would have had the necessary knowledge to create a "Fälschung", but considering the tendency of the prisoners to show hyperbolic exaggeration, in this case, the forgery would certainly contain a much higher Leistung. It is therefore possible that the document is authentic. With that hypothesis, it seems to me important to recall attention to the Pressac observation which was mentioned at the beginning: that the Leistung indicated in the subject document has an obvious mathematical relation to the ratio stated in the "Erläuterungsbericht zum Vorentwurf für den Neubau des Kriegsgefangenenlagers der Waffen-SS, Auschwitz O/S." of 30 October 1941. "Zur Beurteilung der Tätigkeit der Baudienststellen und zur Überwachung der befohlenen Baufristen ist es unbedingt erforderlich, dass sämtliche nachgeordneten Dienststellen die Fertigstellung eines Bauwerkes oder Bauvorhabens umgehend melden. What the directives of Kammler required was the communication of the "Fertigstellung" of a BW and the indication of the relative Übergabeverhandlung (transfer proceedings), as appears in the referred document. For that reason, the mentioned "Aufstellung der bereits übergebenen Bauwerke an die Standortverwaltung" (the list of the already transferred construction projects to the local administration), written according to the directives of Kammler, contains among other things, the reference number of the Brieftagebuch of the letter with which the Übergabeverhandlung of a BW was transmitted to the "Kommandantur des K.L. Auschwitz", the date of the Übergabe and the Brieftagebuch of the "Meldung an Amstgruppenchef C". Now, if the Crematorim III Übergabeverhandlung was written on 24 June 194318 and transmitted to the Kommandantur that same day19 and if the Standortverwaltung had officially taken Crematorium III in consignment on 25 June,20 in that letter of 28 June there is no reference to that fact - and that is the fact absent that should be present. 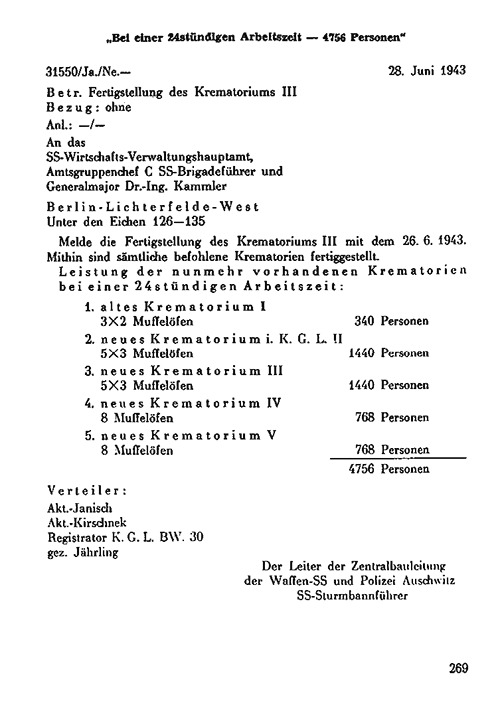 The announcement of the "Fertigstellung" was a purely formal act relating precisely to the Fertigstellung of a BW, not to its technical particulars, and therefore in the 28 June 1943 letter, the indication of Crematoria Leistung (capacity) is bureaucratically senseless - and that is what is present that should be absent. The indication of Crematoria Leistung shows in turn two other anomalies: Above all, the use of the term "Personen" (persons). This label appears rather strange to me: in such a context, I would expect the term "Leichen" (corpses) or at least "Häftlinge" (inmates/prisoners). Then, the operational time period in which Leistung is presented: ("bei einer 24 stündiger Arbeitszeit") (within a 24-hour work period) is simply technically senseless because of the fact that crematory oven activity required a daily stop of a couple of hours for the cleaning of the oven grills and the removal of coke ashes. This does not mean that a cremation activity could not have been possible for 24 hours or more, only that after some 20 hours of activity, crematory oven efficiency would have progressively worsened until it would have totally stopped! Now since the Leistung indicated in the Bischoff letter is technically impossible, how can we believe that the engineers of Amt C/III, observing this false information, did not require an explanation from Bischoff? On his own, Bischoff would have answered, and based upon the question, a whole correspondence would have resulted of which there is not a trace. Similarly, Järhling, who three months earlier had drawn the previously cited Aktenvermerk concerning the Birkenau crematoria coke consumption based upon information from Topf23 and therefore knew the capacity of the cremation ovens, he [Jährling] could not have failed to react, in view of the figures given in that letter, and then not leave a written trace of his perplexity. The most obvious conclusion we come to from the observations given above, is that the author of this letter did not have much familiarity with the technicalities of crematoria Leistung, and still less with the bureaucratic procedures which were in force, and that presumably it was a person coming from a Sachgebiet (specialty field) other than the Zentralbauleitung, and still inexperienced in the bureaucratic procedures of his new job, perhaps typically SS-Sturmmann Nestripke. 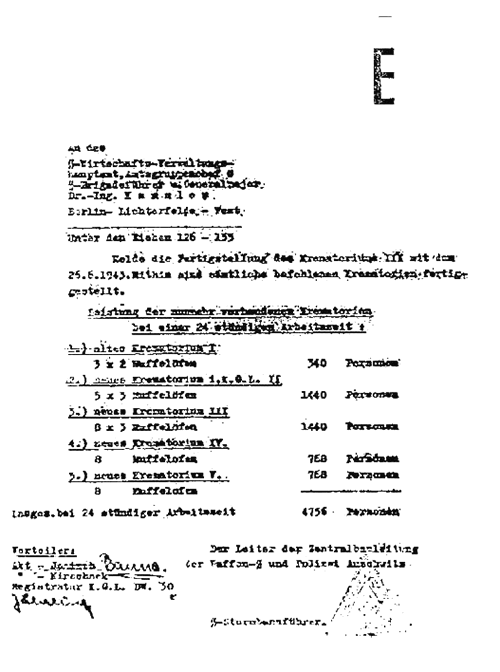 The author of the letter would then have added on his own initiative to the communication of the Fertigstellung the non-requested information concerning crematoria Leistung, based upon the Erläuterungsbericht of 30 October 1941, because - as revealed by Pressac - the Leistung of the ovens had to correspond bureaucratically to that indicated in this document.24 It would therefore not be a matter of intentional "exaggeration" to brag about the performance of the assumed extermination machinery at Auschwitz, but only of a simple question of bureaucratic coherence. The fact that the copy of the correct version of the 28 June 1943 letter does not exist in the Zentralbauleitung archives could obviously depend upon the selection of documents made by the Soviets. I conclude with one last observation. Above I mentioned the double mistake of the 28 June 1943 letter that could not have escaped Bischoff's attention. The first one is the very presence of Leistung within a document in which Leistung should not have appeared, and this is a true fact. The second mistake is the [rate of] Leistung itself which that letter attributes to the crematoria which is in clashing contrast with a document of the Zentralbauleitung signed by Bischoff almost a year before. Therefore, Bischoff was well aware of the falsehood of the information relating to crematoria Leistung contained in the 28 June 1943 letter, and this proves his total innocence in this. Unless one wants to maintain as in the 1989 Pressac version, that they had intentionally lied to brag about a non-existent efficiency of a presumed extermination machine, but this hypothesis is untenable for various motives. In the first place, this explanation could make sense if the letter in question had been addressed to RSHA (Reich Main Security Office), the institution allegedly directly responsible for the alleged Hebrew extermination; but why would Bischoff have had to exhibit himself in a show so gross and absurd in front of the boss of Amtsgruppe C of the SS-WVHA (Economic-Administrative Main Office) that cared so much for "Bauwesen" (construction matters)? And how could Bischoff have hoped the engineers and technicians of Amt C/III would not notice that the Leistung quoted in that letter was false? Secondly, there is still the formal anomaly indicated above: why would Bischoff have drawn a bureaucratically senseless communication indicating non-requested data and omitting requested data? Since this had nothing to do with the request of the Fertigstellung, we must suppose that he had received an explicit request to that effect from Kammler, but then, according to procedure, he would have answered with a specific letter, mentioning in the "Bezug" (in reference to) of the heading, the Brieftagebuchzeile and the date of the Kammler letter. Thirdly, why did not Bischoff sign that letter? According to procedure, Bischoff regularly signed with an abbreviation the carbon copies of the documents drawn by himself or in his name. Naturally, this interpretation is also an hypothesis, but it does raise serious problems which students of the history of the Concentration Camp Auschwitz, beginning with J.C. Pressac, cannot underestimate. APMO: Archiwum Panstwowego Muzeum w Oswiecimiu, Oswiecim. TCIDK: Tsentr Chranenija Istoriko-dokumental'nich Kollektsii, Moscow. WAPL: Wojewódzkie Archiwum Panstowowe w Lublinie, Lublin. For a general background of the problems treated in this article, I refer to my study The "Zentralbauleitung der Waffen-SS und Polizei Auschwitz", Edizioni di Ar, 1998. On the other hand I present some preview of my work, The Auschwitz Crematoria: An Historical-Technical Study. C. Mattogno and F. Deana, Die Krematoriumsöfen von Auschwitz-Birkenau, in: E. Gauss, Grundlagen Zur Zeitgeschichte. Grabert Verlag, Tübingen, 1994, pp. 281-320. J.C. Pressac, Auschwitz: Technique and Operation of the Gas Chambers. The Beate Klarsfeld Foundation, New York, 1989, p. 244. This affirmation is totally unfounded: the 3 Topf two-muffled ovens of Crematorium I, though they would have had a similar Leistung as the Topf two-muffled oven of Gusen, would have had a maximum theoretical Leistung of 216 corpses in 24 hours. This hypothesis is unreal because the exceptional Leistung of the Gusen oven (theoretically 72 corpses in 24 hours) depended upon the special formation of the Schamotterost (fire-brick grate) and presence of the Saugzuganlage (intake installation). APMO, BW 30/34, pp. 27-32. The Betriebsvorschrift des koksbeheizten Topf-Driemuffel-Einäscherungsofen prescribed to introduce the corpses in the muffles "hintereinander" and "nach einander", not two at a time. Photocopy of the document in J.C. Pressac, Auschwitz: Technique and Operation of the Gas Chambers, p. 222. J.C. Pressac, Die Krematorien von Auschwitz. Die Technik des Massenmordes. Piper Verlag, München, 1994, p. 103. In the animal crematory ovens of the cited H. Kori, in which, depending on the model, from 250 to 900 kgs of organic animal substance was reduced (complete carcasses or partly), in optimal condition, the duration of the cremation required from 54 to 43 seconds per 1 kg of organic substance; the consumption of fossil carbon varied from 0,328 to 0,268 kg. These data are directly relative to the load of the oven; for example in the smaller model, the cremation of 250 kgs of organic substance (equivalent to 4 corpses of 62.5 kgs of organic substance (equivalent to 4 corpses of 62. Kgs each) required about 3 hours and 45 minutes, equivalent to about 56 minutes for each corpse. J.C. Pressac, Die Krematorien von Auschwitz: Die Technik des Massenmordes. Randnummer 252a p. 142. J.C. Pressac, Les cr�matoires dAuschwitz. La machinerie du meurte de masse. CNRS Editions, Paris 1993, note 252, p.107. APMO, 30/25, p. 14. Brieftagebuchzeile and "31550/43/Ja/We". The abbreviation "We" could be a transcription error. That is from other offices of Zentralbauleitung. Letter of Kammler "an sämtliche Bauinspektionen und Bauinspektionen und Baugruppen" of 06 April 1943. WAPL, Zentralbauleitung, 54, p. 68. The accompanying letter by Bischoff shows erroneously the date of 23 June 1943. TCIDK, 502-2-54, p. 21. Aktenvermerk of Jährling dated 17 March 1943. APMO, BW 30/7/34, p. 54. This document contains the autograph signature of Jährling. Moreover, the Leistung attributed to Crematorium I has no relation to the above-mentioned document, nor with reality and it is quite difficult to say where it comes from. APMO, BW 30/25, pp. 11-12. I forni crematori di Auschwitz. Studio storico-tecnico.